There is NO NEED whatsoever to try to format the SDcard, repartition it, or anything else of the sort. Its a waste of time and unnecessarily shortens the life of the sdcard; additionally there’s a decent chance it will still not do what is needed. Just burn the image on the sdcard, without any other prep work, and then when you first boot the DC with this sd card, do a “config reset” from the lcd menu. Thats it. Config reset is NOT optional. With the lcd menu “config reset” and “factory reset” options available, there is NEVER any need to try to repartition and/or format the sdcards. Factory reset also removes downloaded files. It will get the job done, but its overkill. Its best to use Configuration Reset first, and only do Factory reset if you still have problems accessing/loging-in/etc. Yes, Configuration reset would have removed the old logins/etc - everything that needed clearing for 5.3 to work correctly - but without removing the accumulated files: Wikipedia/News/Weather etc. On September 12, 2018, I was privileged to setup and demonstrate Dreamcatcher 3.03 in Fort Collins, Colorado. The LNB was set up with a short cone the size of a 12-oz drink cup and set up on the pvc pipe stand… Received signals -78 Rssi, -5 SNR (wow!). The entire setup including the hotspot connection to the computer took less than 20 minutes. Aiming was easy (using sliding bevel, bubble level and compass) and was locked on in a minute or so after boot up. I was able to demonstrate the Rachel database from SD2 also, so hopefully made a good PR demo for Othernet and Rachel. The equipment and firmware all performed perfectly, thanks team! @maxboysdad Can you include a picture of that setup here? Lots of reset talk. I intend to do a fresh install. I know all user data would be lost, really didn’t add or save anything. Plus refreshing and reformatting the SD card is a good idea. Am I correct? Plus refreshing and reformatting the SD card is a good idea. Am I correct? user data won’t be lost. If you write 5.3 on top of 5.2 then you MUST do a config reset, which means any wifi passwords, etc you may have configured will go. That has nothing to do with user data. Or downloaded files. all that will remain as it is. And reformatting is NEVER a good idea. What if a brand new user wants to start from scratch? Then what does he do? Just flash the SD card that you want to use with the dreamcatcher if you have the lnb and dreamcatcher already. This method seems to go against Abhishek suggestion. I have been using this method for years and always worked. I run Linux Mint 17.2. It has 2 programs, one called USB Stick Formatter and the other USB Image Writer. They work super fast. I first download the compressed file, extract it, format the SD, then write the extracted file to the SD. However, I’m not sure what will happen if I use the Image Writer to burn the 5.3 image on top of 5.2 on the SD. So, I think I would rather become a new user. No matter if you are a new user or an old user, if you are using an old SD card or a new SD card, if the old sd card was used for Skylark or for something else: YOU DO NOT NEED TO REPARTITION OR REFORMAT. ALL you need to do is burn the latest image on the card. Thats it! In the specific case of burning 5.3 over sdcard that was already working with 5.2, you will need to do a “configuration reset” from the LCD menu when you first boot the SD card after writing 5.3 over it. Never ever EVER reformat or repartition your sdcard: Never! Just burn the new image on the SDcard. Thats ALL. If you follow that, worst thing that can happen is you may have problem logging in, or the wifi may not connect to STA. This will happen in the specific case of going from 5.2 to 5.3 as that was a breaking release. In such case (and such case ONLY) you will need to do a “configuration reset” via the LCD menu when you first boot the sdcard after burning 5.3 on it. Thanks Abhishek! 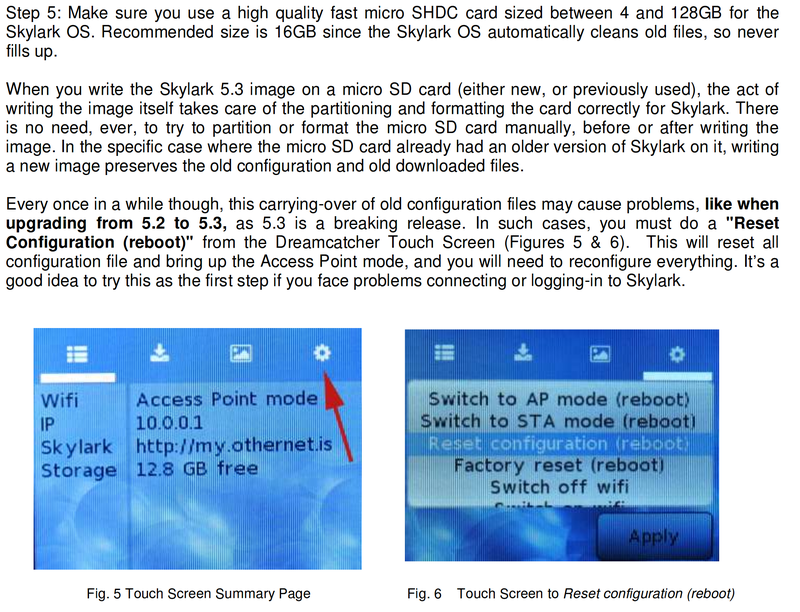 I got Skylark 5.3 working on Dreamcatcher 3. Only glitch is when I switched to wifi mode. Got a Java error. But, I continued and all is well. I see Skylark on the router. Not sure I see me on the Dashboard. There has been 2 in Southern California with Skylark 2. I now see 1. Is that me? Not sure I see me on the Dashboard. 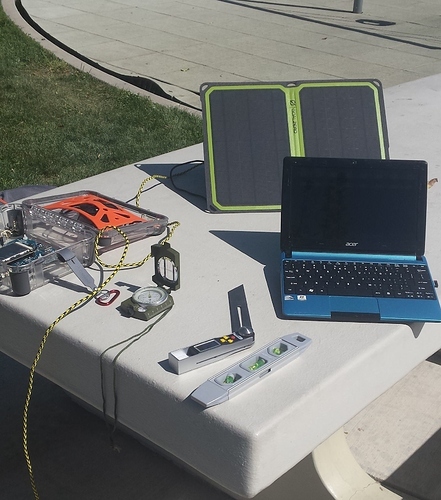 There has been 2 in Southern California with Skylark 2. I now see 1. Is that me? I have no way of knowing who a particular balloon belongs to - there is no user identity information at all. If you really want to know you can try turning off the DC3 for ~10 minutes and watch you balloon go away, and then turning it back on, and watch while your balloon comes back. OK the 1 balloon in CA is me. How come I see Bitrate at 2 and Packet rate at zero? All other data looks good. A couple hours later both Bitrate and Packet Rate are normal. Sorry to be so late with a reply. I will attach photos here. What you see is the equipment I set up in Fort Collins, Colorado to demo the Othernet and Rachel. 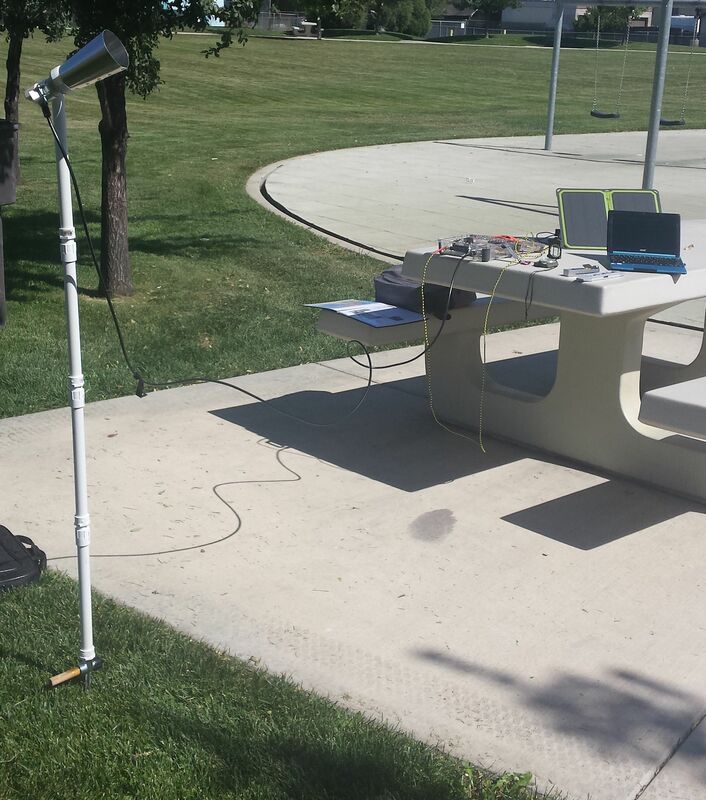 I was unable to photograph the setup in Fort Collins, however, this is identical to what I did there. The Dreamcatcher 3.03 is mounted in the clear box, power equipment is by Goal Zero. What is your SNR without the drinking cup? It varies around -7 to -9 without the cone.